Two local museums are closing the year and welcoming the new one with an old question: does size matter? Small is in, at least at the Norton Museum of Art, which currently has on view a series of miniature paintings and bronze sculptures adorning the walls and rooms of dollhouses. This is no kids’ play, though. The artworks are by Julian Schnabel, Michele Zalopany and Cy Twombly, among other famous artists. To understand how this came to be, we must first meet the mother of a local art collector. Having befriended Twombly in the 1980s while studying art abroad, Douglas Andrews and his mother, Lucy Bassett Andrews, welcomed the famous artist at their Jupiter home several times. It was during one of those visits and upon noticing the charming structures Miss Lucy created to entertain her granddaughters, that Twombly proposed the idea of a mini group show. 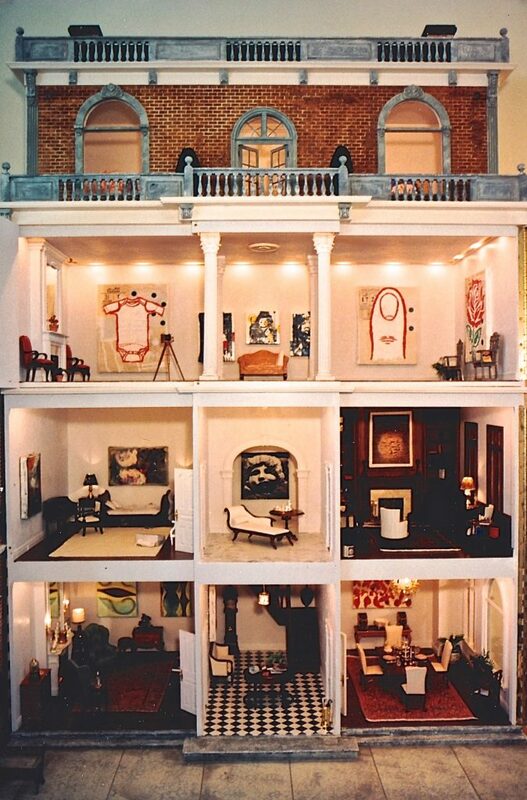 Since 1993, other artists have joined the call to create artworks specifically for her dollhouses. An abstract acrylic painting from that year is personally dedicated to her via its title: Black and Blue for Miss Lucy. 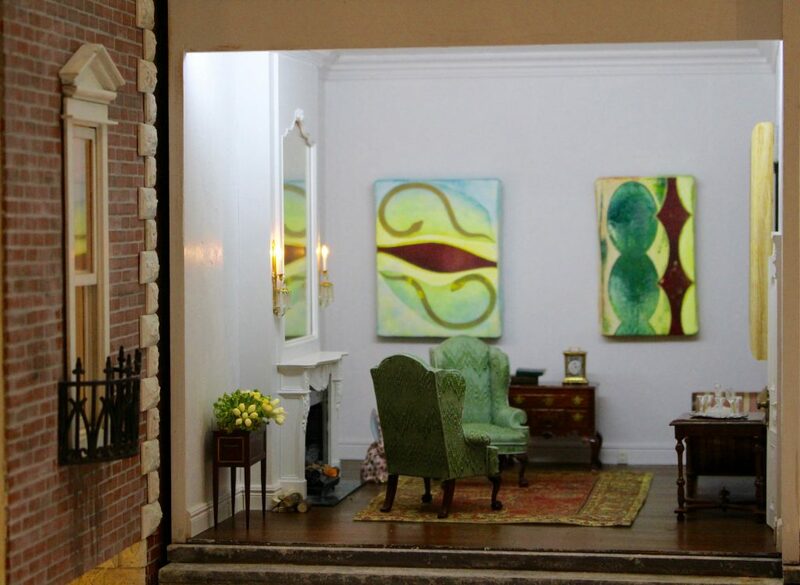 Located in the house to the far left, it is by American painter James Brown. This year saw artistic contributions from Terry Haggerty, Arturo Herrera, and Rebecca Warren, all of which can be spotted hanging in different rooms. Haggerty’s single-color linear installation adorned the museum’s main lobby in 2014. This time, and in blue, his geometric abstraction takes over a wall in the barest of about 17 rooms displayed. A white cloth protects the wooden floor from paint splashes and a ladder remains in position suggesting this is a work in progress. 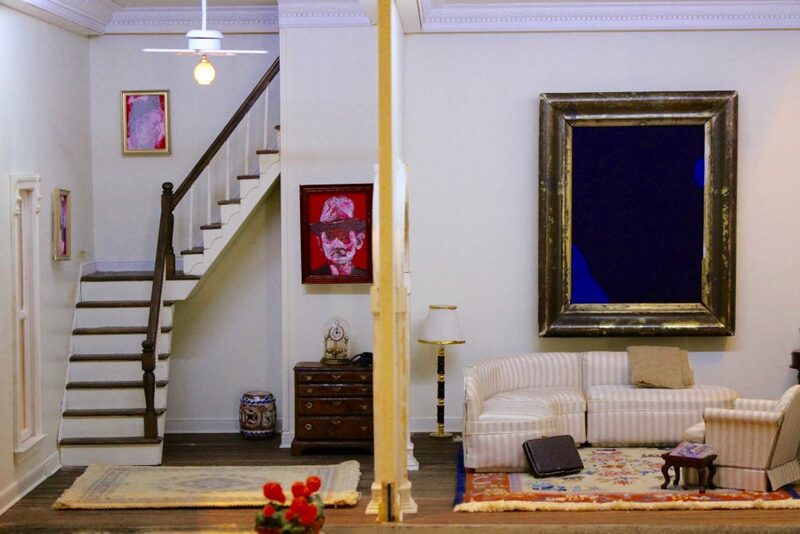 Miss Lucy’s 3 Day Dollhouse Party, which owes its title to the 3-day “opening” party held by the Andrews 24 years ago, consists of three structures housing more than 40 artworks. The house to the far right alone opens up to more than six rooms. It is here that we spot five works by Schnabel (top/balcony level) and two by Twombly’s son, Alessandro (ground floor dining room). The three bronze trees adorning the side garden are by Donald Baechler. There is a lot to see aside from the actual art. The interior decoration and façade are striking. Such abundance of detail seems unnecessary if collecting notable mini paintings were the sole purpose of the enterprise. Looking at the lanterns, crown molding, water fountains, chandeliers and fireplaces, it is obvious this is first and foremost a labor of love and perseverance. Dollhouse Party runs through February 4 as part of the museum’s Spotlight series. While going this small poses an inevitable impediment and impairs the view, it is precisely the inconceivable dimensions that make the exhibition appealing. 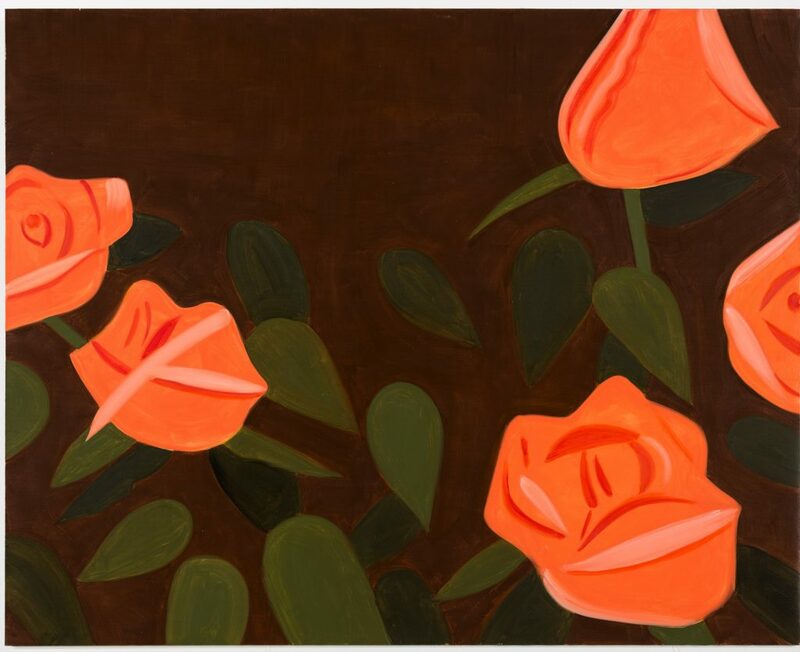 It is that curiosity for the smaller-than-usual that Boca Raton Museum of Art hoped to trigger with Alex Katz: Small Paintings. Billed as rare offerings by a renowned American figurative artist associated with huge canvases, the pieces on view are neither large enough to spark much interest or small enough to intrigue. Katz, whose career began in the late 1950s and who is still hard at work in his current 90s, is widely known for his simplified compositions, clean lines and flat colors. Combined and in large scale, these elements have led to renditions we are familiar with: powerful portraits and landscapes that seemed effortless, uncomplicated and created out of thin air. Ukulele Player, one such example of his bold mastery, recently sold for $147,600. We are told to appreciate them for their revealing power into the mind of one of the greatest living American artists, but the degree to which the museum explores small here doesn’t go far enough to make the show fascinating. It is caught in between. It comes out as a bore. Making matters worse, two massive oil pieces meant to complement the small ones end up emphasizing the exhibition’s shortfalls and reminding us what we are missing. Extraordinary in color, execution and simplicity, Yellow Flags (84 x 240 inches) and Pink Roses 4 (96 x 120 inches) reward the senses in a way white walls cannot. Yes. There is a lot of wall. To illustrate a person’s particular creative process is very much welcomed for its educational value, revelatory quality and contribution to a better understanding of a body of work. Museums often add sketches or drafts to accentuate the highly personal methodology or line of thinking a final product derives from. Making it the whole focus of a show, however, can be dull. When it comes to some American masters at least, no matter how insightful preparatory works may be, we recommend not settling for anything other than impressive and big. Miss Lucy’s 3-Day Dollhouse Party runs through Feb. 4 at the Norton Museum of Art, West Palm Beach. Admission to the Norton is free through 2018 as the museum undergoes extensive renovation and expansion. For more information, call 561-832-5196 or visit www.norton.org. 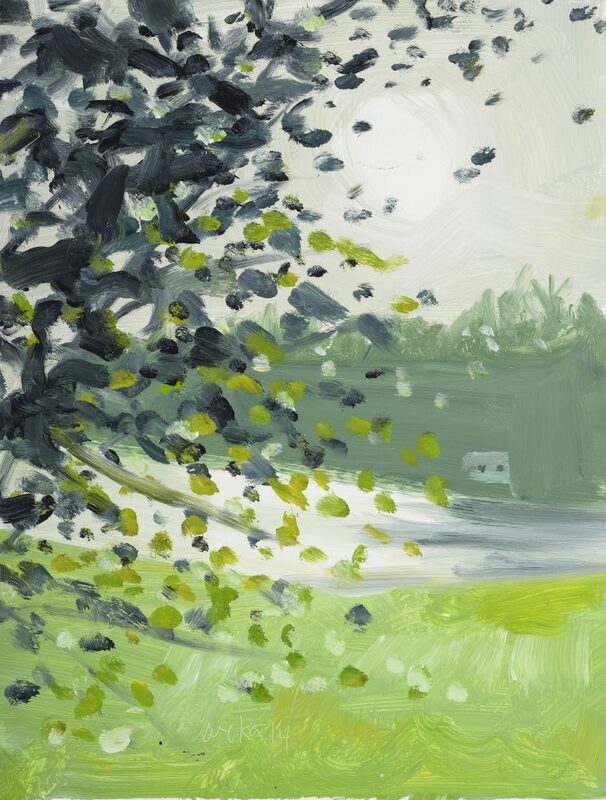 Alex Katz: Small Paintings runs through April 8 at the Boca Raton Museum of Art. Admission: $12. Hours: 10 a.m. to 5 p.m. Tuesday, Thursday and Friday; 10 a.m. to 8 p.m. first Wednesday of the month; 12 p.m. to 5 p.m. Saturday and Sunday. Closed Mondays and holidays. Call 561-392-2500, or visit www.bocamuseum.org.